Jewish National Fund Tree Certificate issued to Newport, Kentucky Talmud Torah Grade School. The Jewish National Fund (JNF) was founded in 1901 to buy and develop land in pre-State Israel for Jewish settlement. 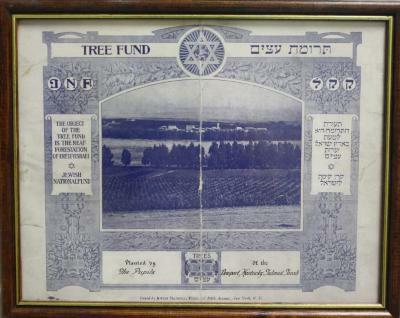 Jews from all over the world contributed funds for the planting of trees. As a result of JNF’s work, over 240 million trees have been planted in Israel to date, making Israel the only country that had more trees at the end of the 20th century than at the beginning.